One of the most loved fictional characters of all time, Hello Kitty and one of the most trusted direct selling companies in the Philippines, Tupperware Brands has collaborated to bring delight to the young and to the young at heart. Say Hello! 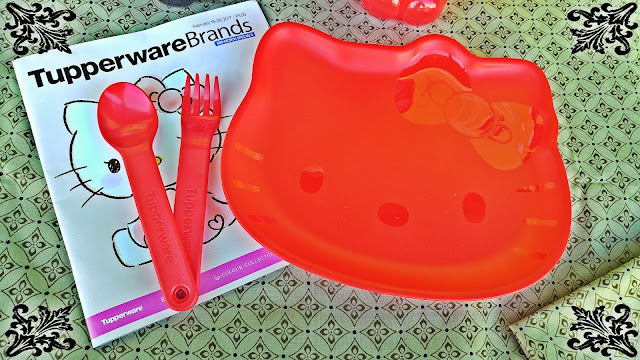 to the limited edition Hello Kitty treats such as Eau Praiche, the Hello Kitty inspired Kids Plus+ products, the dining plate with cutlery set and the Hello Kitty eco bottle. 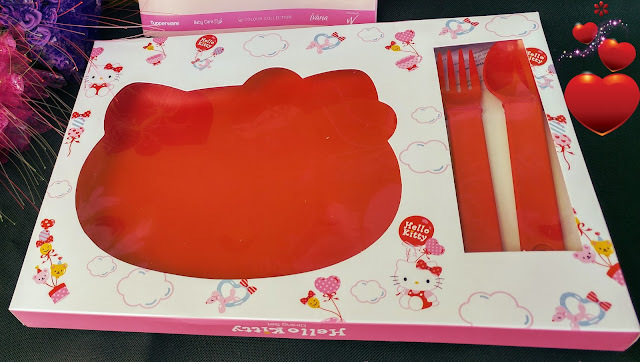 Let me share to you first the Hello Kitty dining plate with matching cutlery set. This microwave-reheatable Hello Kitty embossed plate measures 23.5cm in length and 20.2cm in height. The plate together with the free cutlery set is unbreakable and does not easily bend. Its material is not the usual soft plastic, it's harder and definitely can withstand heat, thus making us sure we are using a safer dining product. This is a very nice gift to all the lovely girls out there who are fans of Hello Kitty and who wants to still look chic while dining in school or outdoors. The plate which is sold together with the cutlery set, comes in a very nice gift box and is available in two colors - Fuchsia Kiss and Chili. The plate itself costs P399.00 but for a limited time, you can buy it together with the cutlery set for the same price. You saved P299.00, which is the actual retail value of the cutlery set. The next exciting stuff from the surprise box are these awesome eco-friendly drinking bottles, that matches with the dining set. Since Tuppeware Brands launched their series of eco-bottles years ago, it has been a big hit among the customers. Workers, pre-schoolers, students, travelers, people who are always on-the-go; will be seen bringing this filled with water or any of their favorite drink. 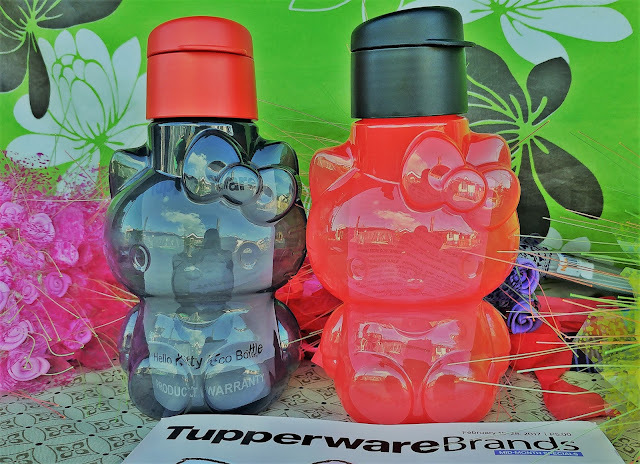 The masses definitely loved Tupperware Brands' eco-bottle for its durability, safety and convenience, which inspired some of the local brands of plastic wares to copy its shape and design. Now, Tupperware Brands is taking the eco-bottle into a more innovative and fashionable design with Hello Kitty. The bottle comes with an easy drinking spout, you'll never worry spilling it while drinking even in moving vehicles and it has sipper seal and tight screw-on cap which make it leak-proof. It can be filled up to 425ml of liquid and comes in Jet Black and Chili. The caps are interchangeable, you can play with colors to give your bottle some "edge." Its regular price is P299.00 a bottle but you can buy the second bottle for P99.00 only for a limited time. Tupperware Brands always has something special for the kids. 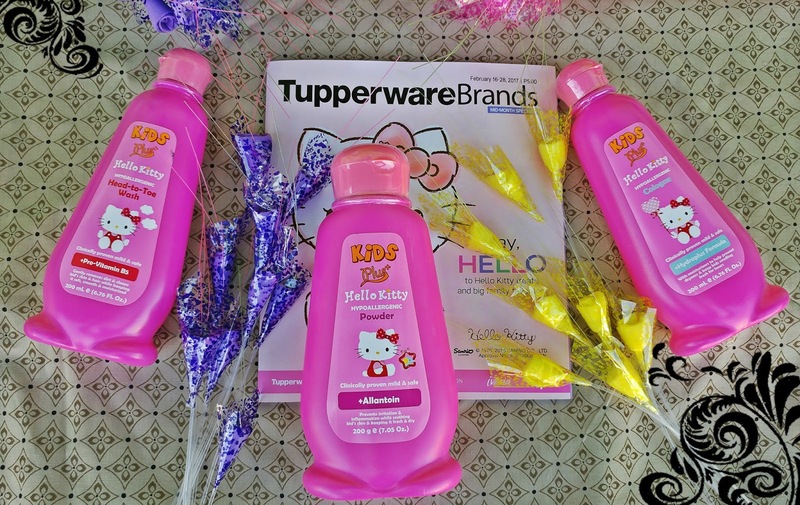 To make kids happy everyday, Kids Plus+ and Hello Kitty teamed up for this limited edition and pH-balanced hypoallergenic, dermatologist-tested head-to-toe wash, powder and cologne. These products is for kids protection throughout the day. Perfect for kids ages 3 to 11, and have fun sweet-smelling scent. 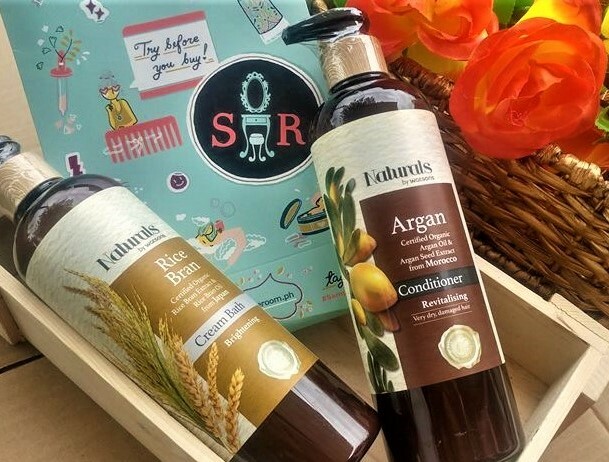 The head-to-toe wash has pro-vitamin B5 that gently cleanses and conditions kid's sensitive skin and hair as well as strengthen hair shafts for a thicker and shinier hair. 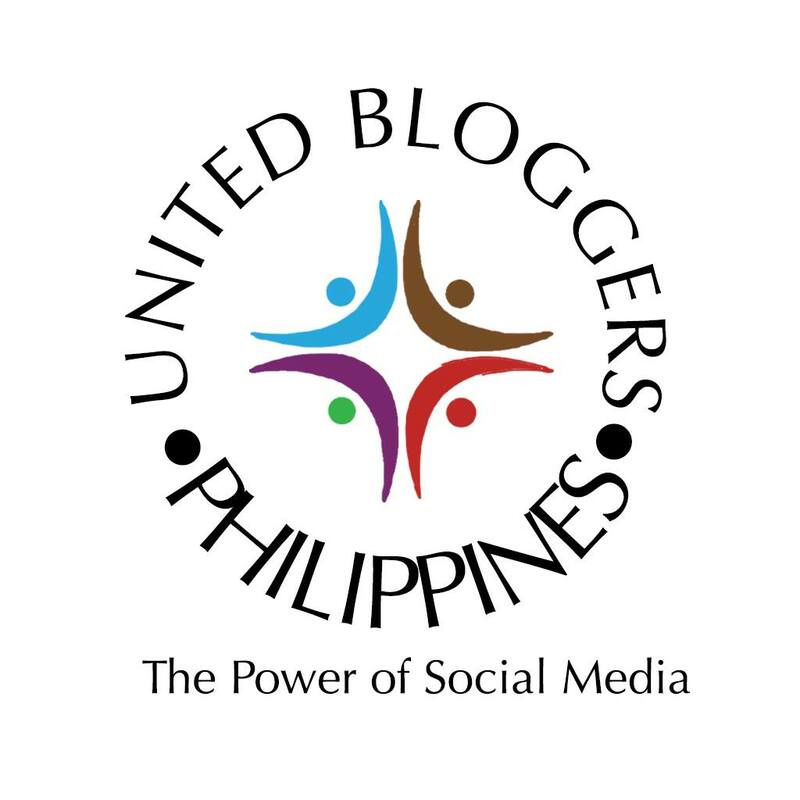 It is now sold at a special introductory price of P159.00 instead of P270.00. The hypoallergenic powder with Allantoin is clinically proven mild & safe. It prevents irritation and inflammation while soothing the skin. It is mild and low-dusting which decreases the risk of inhalation. It will keep the kids skin fresh and dry all day long. Sells at P159.00 from the regular price of P260.00, for a limited time. 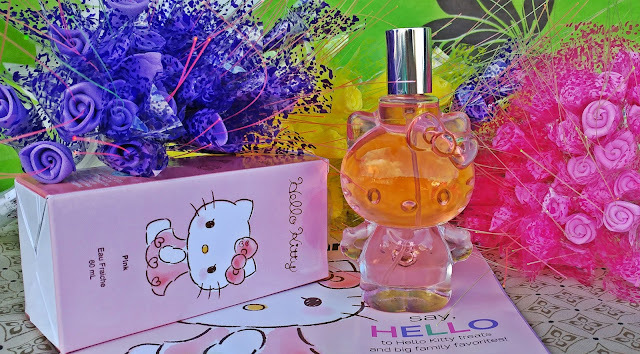 The Kids Plus+ Hello Kitty cologne is formulated with Hydraplus, moisturizers that help prevent dryness, thus kid's sensitive skin stay soft, smooth and freshly fragrant.You can buy the 200ml cologne for P159.00 instead of P270.00 for a limited time also. My daughter who is in the fourth grade, was really delighted to have the powder and the cologne added to her daily belongings in school. 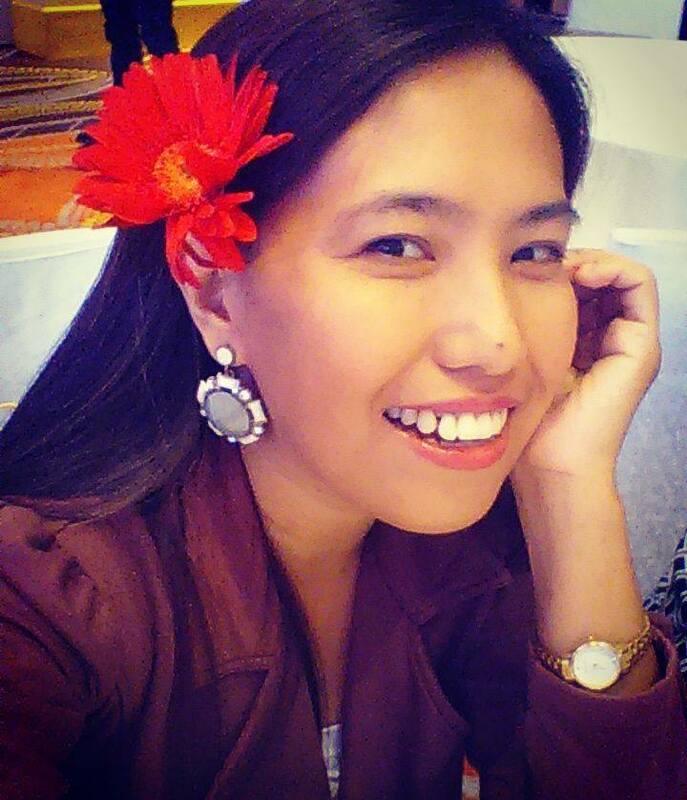 She really feels more confident now that she is smelling fresher and is feeling more comfortable the whole day. Since I became a stay-at-home Mom, it is very rare that I buy my favorite perfume or even cologne, because they only expire and their scent either "spoils" or "disappears." I was very glad when Tupperware Brands Philippines included this 60ml Pink Hello Kitty Eau Fraiche in the box. You know, whenever someone gives me a perfume or a cologne it makes me feel special. This new and limited edition product smells so feminine and romantic. Its modern floral fruity scent is full of class and sophistication. What is Eau Fraiche by the way? It is a scented substance similar to perfume and other fragrances, and literally means "fresh water." It has the lowest essential oil percentage of all fragrances available. For those who have very sensitive smell like me, this product is perfect because the fragrance is subtle, you won't worry about getting dizzy. Because the price of the perfume depends on the amount of essential oils, this Eau Fraiche is a lot more affordable. 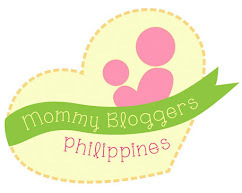 It is curently being offered at a special introductory price of P599.00 instead of the regular P899.00 per bottle. 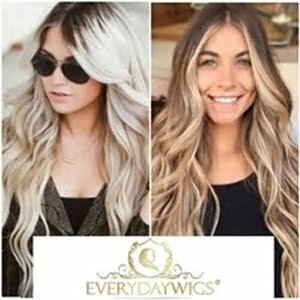 It is also available in Blue, representing a lively personality and in Purple, which is best for girls, ladies and women who wants to stand out, be unique and make a statement. 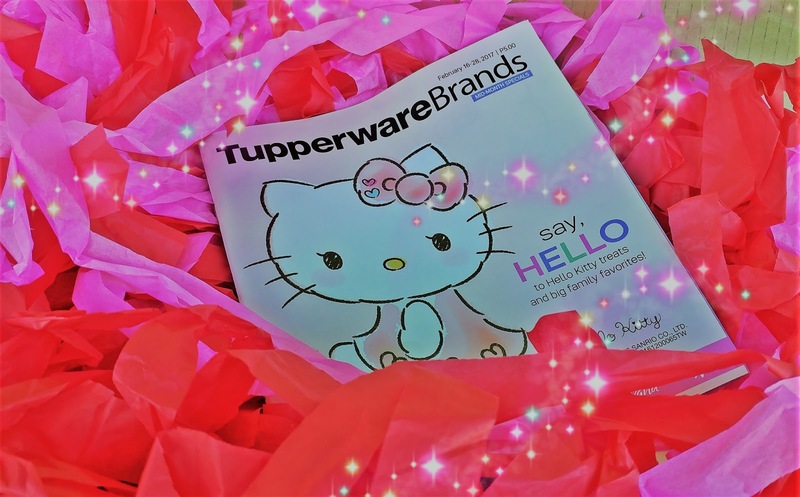 These are all new and limited edition of Hello Kitty products being introduced by Tupperware brands. Hurry up cause stocks quickly run out! These are so cute! I'm a big kitty fan! Used to be HelloKitty's fans! These serial are so cute! oh such cute products with Hello Kitty on them! I love the plates, I'm sure my daughter would love them. I can't imagine older girls using these except maybe in Japan where it's totally ok to be a grown adult eating off hello kitty plates. 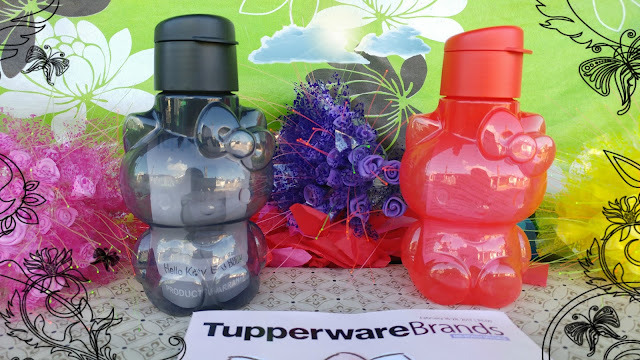 These uber kawaii Hello Kitty items from Tupperware are a must for mums with daughters! I wish I had one so I had an excuse to get these items! Haha. I so love the dinnerware. I hope they will come up with something for the boys soon, so I can get a set for my little man. This brings joy to my heart! I have always loved Hello Kitty and had multiple lunch boxes with Hello kitty on it. Haha! With the tupperware though, I remember my mommy constantly reminding me to bring her precious tupperware back home whenever I'll bring some at school. Haha! Box of Joy Birthday Sale! !